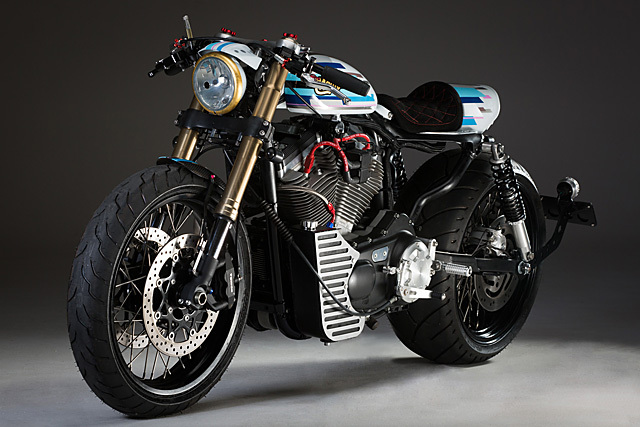 Perth’s Mean Machines are one of Australia’s leading custom bike builders. As a workshop that once built a Triumph Bonneville with a 200 section rear tyre, you always expect big things when they unleash a new machine. 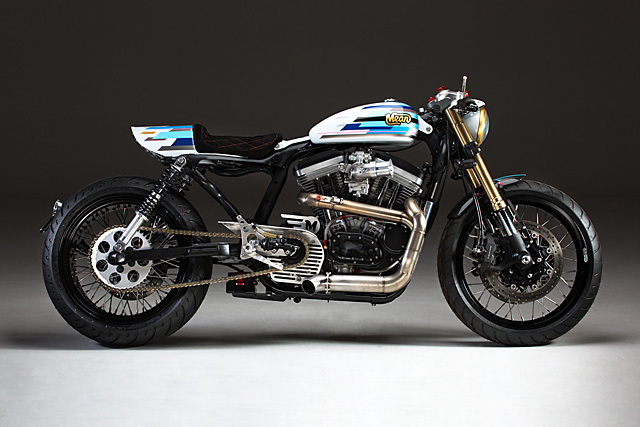 Well, Wenley Andrews and his crew haven’t let us down with a ‘04 Harley Davidson 883 Sportster that’s stripped at the waist, packing plenty of punch and showing off one hell of a rear end. 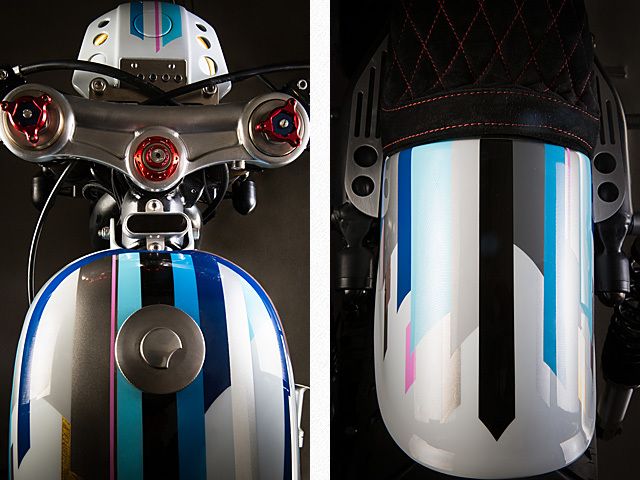 Even for Wenley, categorising the build is difficult “The word racer was brewing in my head, I decided to make the bike’s theme into a drag/race bike, but I’ll let you guys decide what it is…” The truth is it’s all that and more, with Cafe Racer influences and old school Bobber touches that mix with the drag racing look. Nicknamed ‘Furiosa’, it’s fair to say this HD is every bit the fearsome, fiery warrior as Charlize Theron’s character in Mad Max: Fury Road. 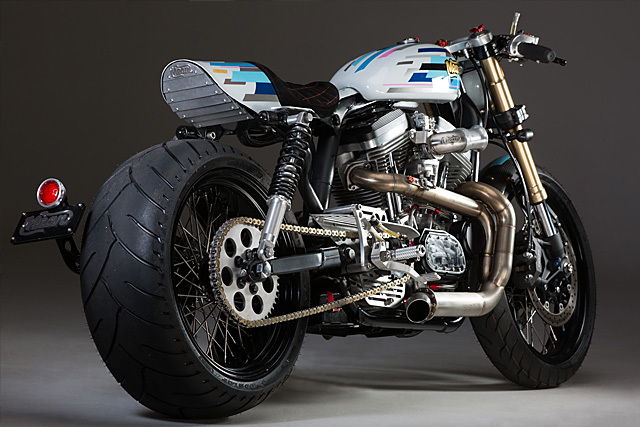 If a lot of Harley builds fall to criticism in one area it is the lack of upgrades to their suspension, but once again Wenley delivers the goods. Having done plenty of front end GSXR conversions in the past on other bikes he translated his skills over to the Harley and with a custom top clamp and bunch of bearing changes it looks so good and performs so well you wonder why it’s not a factory option. Custom braided brake lines were added and with the Suzuki swap also comes the benefit of the big twin rotors clamped by quality Tokico calipers. Clip-on bars and shorty levers give an entirely different feel to the usually Harley front end while a quick email to the guys at Motogadget took care of the switches, speedo and M-can that work in-sync and result in an ultra clean look. While over on the other side the new rearset that facilitates the gear changes looks just as good in the raw finish and with the pair rear mounted the rider gets much sportier ergonomics than you expect from a Harley. 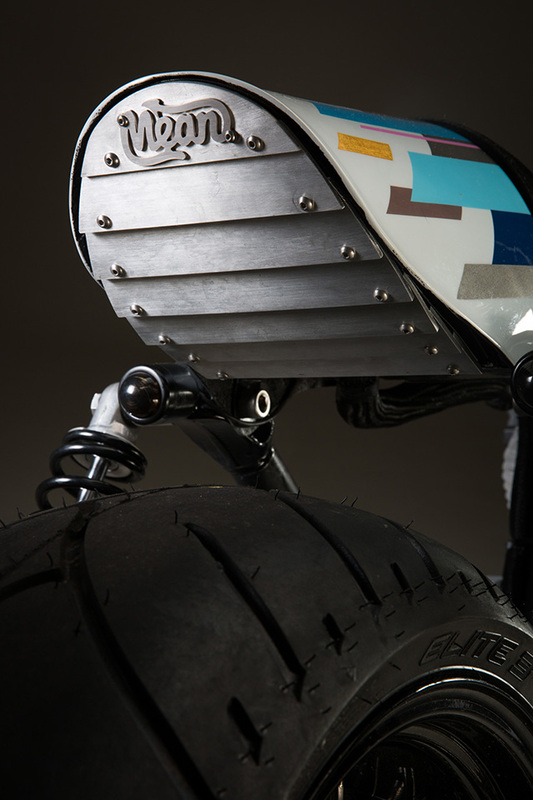 But the rearsets weren’t the only change as a result of the big tyre and chain drive conversions, with the desire to achieve a less cluttered look and show off that Cafe Raceresque negative space between the tyre and engine more changes would need to be made. For Mean Machine this was no problem at all and they repositioned a new custom oil tank at the front of the bike, complete with braided lines and high-end fittings it’s what you’d expect to see at the drag strip. 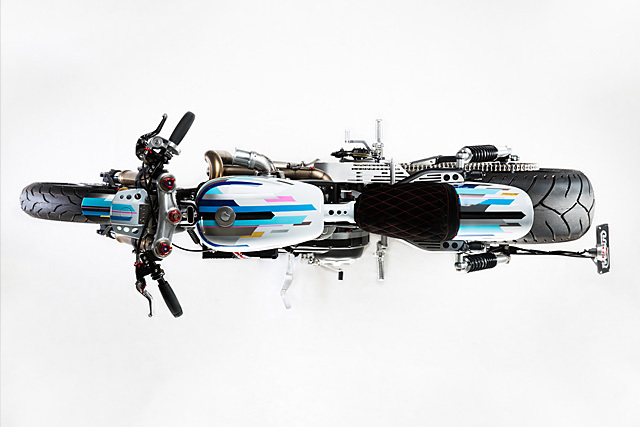 The battery was also cleverly hidden and now sits on its own tray at the centre of the bike below the swingarm; Both these modifications bringing the centre of gravity even lower to the ground. A Mean Machine with the name Furiosa can’t be under powered and although the standard 883 engine is no pipsqueak Wenley knew he wanted more grunt. With a racing style machine on his mind there was a clear solution, take the 883cc engine out to Harley’s own 1200cc race engine capacity. This was all done in-house with a big bore kit featuring Wiseco forged pistons inside new big bore cylinders fitted to the standard bottom end. The result is a brute, with an engine much closer to a square bore, you get all the advantages of increased torque with more power from a freer revving engine that doesn’t suffer the friction loss of the overly undersquare 883. To add to the tough look of the new motor the team made a velocity stack on the lathe, with the welded connection pipe joining to a laser cut opening for a precision fit. 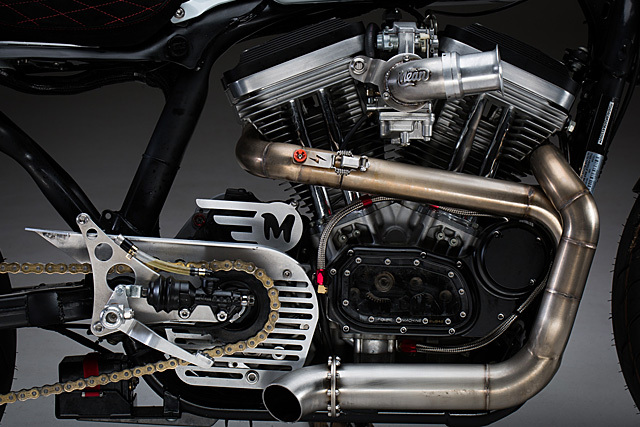 Surpassing the throaty intake roar is the noise emanating from the stunning custom stainless steal exhaust that instantly adds some racer cred. Not happy with the simple exhaust springs Wenley made a latch to keep it all together and it’s these little fabrication tricks that show off just how good Mean Machine are. 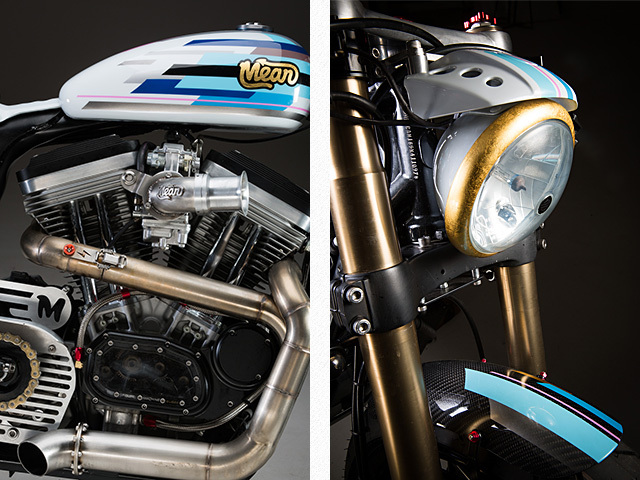 Finishing out the build are the “Mean” logos, gold leaf on the tank and raw metal items on the intake and custom rear. All that is left for Wenley and the boys to do is decide who gets to climb aboard Furiosa, throw a leg over the suede seat with red diamond stitching and hang on, because she rides you as much as you ride her!